outdoor education | Going Wild! Give your children a head start in school, send them out to play! Does outdoor play make children smarter? Apparently it’s official, a growing body of research shows mucking about outdoors actually means children do better in school! look at this article…..
National Trust “Outdoor Nation” Blog; Should I Iet my children play in the snow? Jared Diamond looks at the developed worlds’ increasing disconnection with the natural world and suggests we should learn valuable life lessons from traditional cultures. Lessons such as making sure we understand and respect the environment and parenting skills where children are given the freedom to explore and get their own perspective on risk. One example he sites is of African Pygmies; “If a child plays with a sharp knife and waves it around, so be it. They will cut themselves on some occasions, but society figures it is better for the child to learn the hard way early in life. They are allowed to make their own choices and follow their own interests.” We believe this makes a lot of sense; it is vital we give our children real world adventures if we want them to develop into to balanced individuals that are able to think for themselves and make informed choices. But do you have to go as far as giving a toddler a knife? A much less scary and simple approach in our opinion would be to start by making sure all our children have plenty of opportunities to immerse themselves in the natural world and have the freedom to just play! 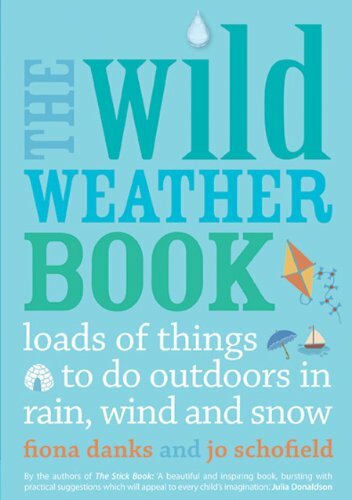 If you need some inspiration, have a look at our new book “The Wild Weather Book” (published in March), which gives loads of fun practical suggestions on how to have fun outdoors when the weather is cold, wet or windy and you might be tempted to just stay indoors! So why are you still sitting infront your computer reading this? Equip your children with the survival skills they are going to need. Tog up warm, put on those wellies and head out for some fun. Who knows you may also go a little way in ensuring the planet’s survival too!